Most of the time, if you could pick up a developed country stock index with a price-to-earnings ratio below 12 and a dividend yield of 3%, you’d be forgiven for thinking it was a reasonable bargain. Low valuations usually mean higher return potential and lower risk. But there’s one country index that looks cheap and yet almost certainly has high risk. It’s found in Hong Kong. Earlier in the week, I started exploring whether financial crises are caused by too much faith in the financial system, or too little (see here). Argentina, where I’ve lived for ten years, has suffered decades of financial crises. As a result, wealthy Argentines – who are well-practised at protecting their assets from the periodic political and financial chaos – keep huge amounts of assets offshore. Most recently, this year, the local currency lost over half its value against the US dollar. One crucial feature of Hong Kong is that the Hong Kong dollar is pegged to the US dollar. Since 17th October 1983, the US dollar has bought 7.80 Hong Kong dollars, managed within a very narrow band. This has brought great stability, and faith in the financial system is high. As I’ll explain later, I believe that excessive faith in that system could have sown the seeds for an impending crisis in Hong Kong. But first, a quick look at the country’s stock markets. Hong Kong’s securities markets can be traced all the way back to 1866, and the stock market was formally founded in 1891. This long history is a legacy of the territory’s former status as a British colony, up until 1997. The MSCI Hong Kong index was launched on 31st December 1987. Since then, it’s returned an average of 11.5% a year, including dividends and measured in US dollars. That compares with 8% a year for the MSCI World index of developed country markets, over the same period. Below is a chart comparing the total return performance of various indices over the past 30 years. 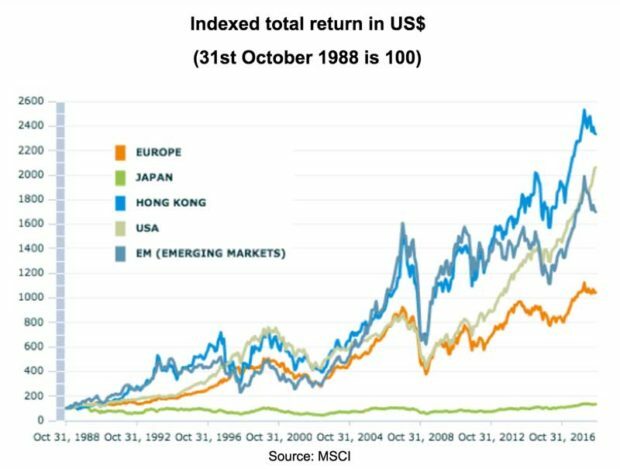 You can clearly see how Hong Kong stocks have outperformed European, Emerging Market and even US stocks over that time. Based on the figures reported for the end of August, and adjusted for price moves since, I estimate the MSCI Hong Kong index currently has a price-to-earnings (P/E) ratio of 11.8 and dividend yield of 3%. On the face of it, that sounds like an attractive level. But now we start getting into the issues. In terms of market capitalisation, 35% of the index is made up of the financial sector (mainly insurance and banking) and 27% is real estate. Ordinarily, that wouldn’t be a problem. But there’s a huge issue lurking behind these sectors which could create serious problems in the near future. 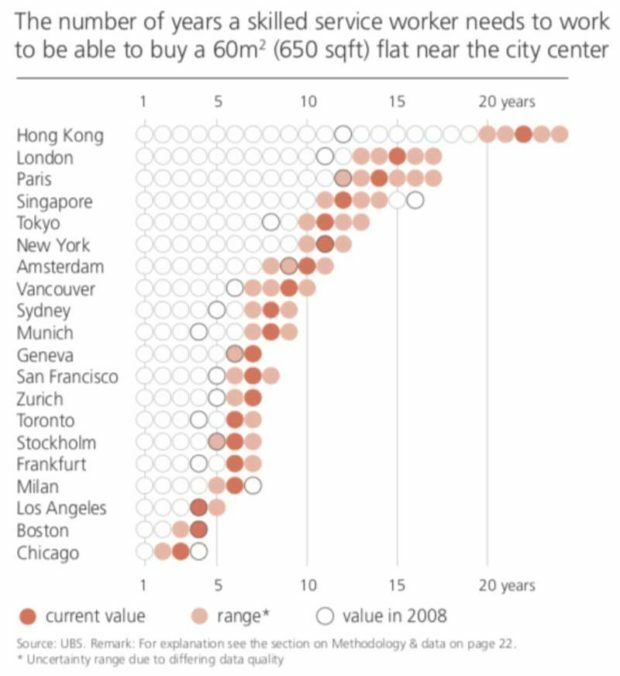 In short, Hong Kong has a massive real estate bubble. If (when) that bursts, it’s likely to cause mayhem for local banks. That’s both due to the distress caused to mortgage loans and also because of the general effect on the local economy. 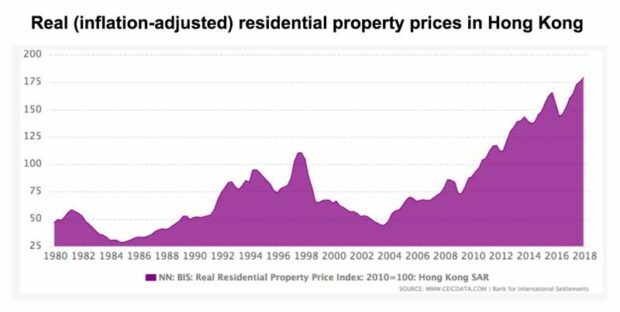 Hong Kong has had property bubbles and busts before. The last major boom happened in the late ‘90s, followed by a deep bust in the early 2000s. I was lucky enough to live in Hong Kong between 2002 and 2005. That was right at the bottom of the market, ensuring much more affordable rents. To illustrate how big the bubble is today, we can look at price progress over time. The following chart goes back to 1980, and adjusts prices for consumer price inflation. You can see the bubble and bust in 1997 / 1998. You can also see how current prices are about 50% higher than the previous peak, in real terms. They’re also 4.5 times bigger than the trough in the early 2000s. 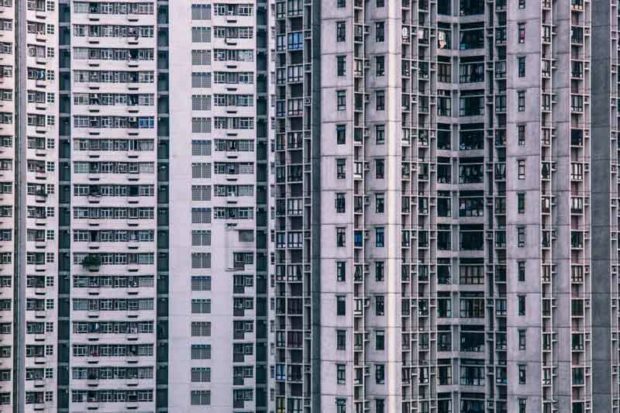 The result is that, according to an article I found from June, Hong Kong’s homeowners were shelling out an average of 60% of their incomes on mortgage payments earlier this year. It’s probably much more by now, given that rates have risen since then. This has all been caused by the Hong Kong dollar peg against the US dollar. Remember, the currency peg dates way back to 1983. Back then, Hong Kong was very much a colony, and mainland China was a full-blown, communist economic backwater. Things have changed dramatically in the past couple of decades, but the peg has remained the same. Since the global financial crisis a decade ago, US dollar interest rates have spent much of the time at emergency lows. To keep the peg viable, the same was done with Hong Kong dollar interest rates. 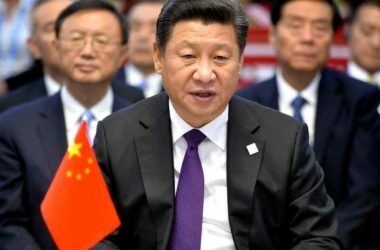 The problem is that Hong Kong is part of China, a country that’s had a relatively fast-growing economy throughout the whole period. Much of mainland China’s vast new pools of private wealth sloshed over the border into Hong Kong. 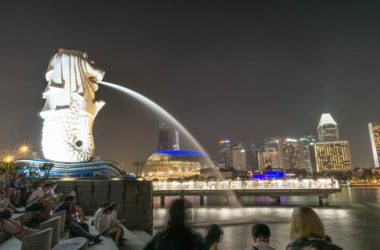 For wealthy mainlanders, it’s a posh place to visit, shop, park money and buy a second home (whereas gambling is done in nearby Macau, formerly a Portuguese colony). The last time I visited – a few years ago – there were some notable differences from when I’d lived there a decade previously. The stores and cars in Central (the financial district) were even flashier. 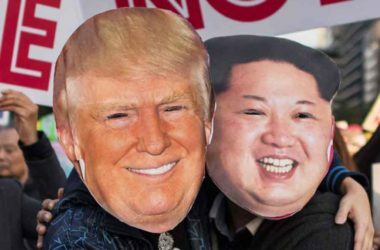 Also, you were much more likely to hear Mandarin Chinese being spoken in the streets and cocktail bars (whereas the locals speak Cantonese, which sounds completely different). Basically, due to the currency peg, interest rates have been far too low in Hong Kong for the local economic conditions. This has allowed ultra-cheap mortgage finance to fuel a massive real estate bubble. 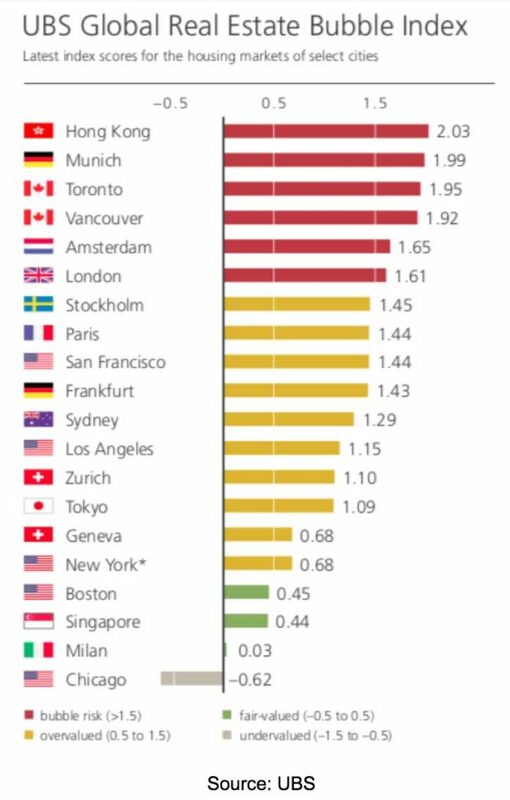 The result, according to UBS, is that a skilled service worker in Hong Kong needs to work 22 years to buy a 60 square metre / 650 square foot apartment. This is up from 12 years a decade ago, and substantially higher than either London (15 years) or Paris (14 years). Of course, US dollar interest rates are now heading up again, which means they’re also rising in Hong Kong (see chart below of three-month HIBOR). In turn, this means Hong Kong mortgage rates are rising. This is where the danger lies. Most mortgages in Hong Kong charge variable rate interest, or have rates that are fixed for only a short period (a couple of years). In that context, imagine someone that spends 60% of their monthly income on mortgage payments, with their mortgage interest rate at 2% (and assuming an interest-only mortgage, with no repayments of principal). Let’s say interest rates increase by just 0.5%, from 2.0% to 2.5%. That would drive the mortgage payments up by a quarter, taking them to 75% of the borrower’s monthly income. In turn, the remaining income for other spending drops from a 40% share to just 25%, which is to say a reduction of 37.5% from the previous level. Hey presto – that’s excessive leverage in action. A modest increase in mortgage rates has devastated the family finances. Hong Kong has a monumental real estate bubble and “homeowners” are highly leveraged. 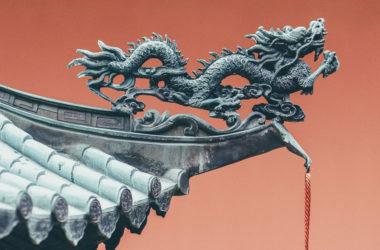 This was caused by many years of inappropriately low interest rates, due to the outdated currency peg, while the Chinese economy kept on growing strongly. As rates rise, the bubble is likely to burst, hitting financial stocks and the general economy in Hong Kong. As a result, although Hong Kong stocks look cheap on the face of it, in reality they’re also high risk. And that’s even before we get into the intensifying trade war between the US and China. As a result, I recommend that you stay away. Finally, I’ll leave you with a quote about Hong Kong’s property prices from the UBS report: “…a sharp correction seems unlikely, given the pent-up investment demand and ongoing low mortgage rates”. Ever heard anything like that before?